Bathroom trends in 2019 bring lots of inspiration along with exciting concepts and solutions to homeowners and designers everywhere! Trends come and go, but this year’s bath trends will encourage long term appeal and application. 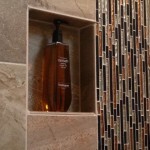 Although the bathroom is a functional spot, it doesn’t mean it can’t be sophisticated and beautiful! Whether you want to make a simple swap or take on a complete renovation, scroll down to see what’s in store for bathroom design this year! Over the last few years, there’s been a big debate on whether the bathtub should stay or go. But it looks like the tub is here to stay! Master bathrooms are growing in size and functionality. The popular modern freestanding tub is creating a stunning focal point in a destination all of its own. By combining the tub area with a beautiful view, it’s taking bath time to a whole new level of rest and relaxation. When it comes to remodeling a bathroom adding a freestanding tub can transform your daily soak into a spa-like experience. 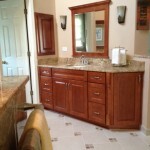 The mix of distressed woodgrain patterns sealed in a clear natural stain is the next trend in bathroom vanities. Farmhouse style still rules but with an eclectic flair. Many of my clients are finding ways to repurpose old wood tables, cabinets, and sideboards to create rustic vanities. 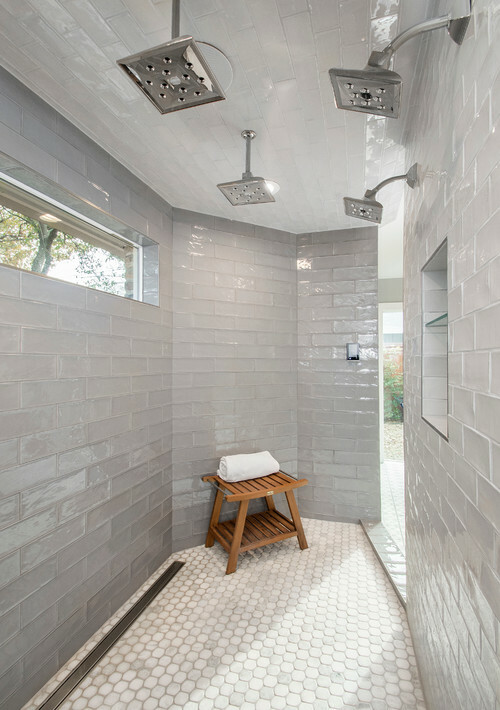 The use and variation of metal finishes, along with patterned Mexican pavers or sleek overscaled tile, make for a unique look. The newest trend in bathroom design is also one of the oldest sought after …a fireplace. Nothing is more relaxing than a warm fireplace paired with a long hot bath …except maybe a glass a wine to go along with it. The flickering flames of a fireplace can be the perfect bathroom destination experience. An electric fireplace insert is relatively low-cost and easy to install and could be a worthwhile splurge this year! Made popular with the Farmhouse design, shiplap continues to make a lasting impression on the walls. 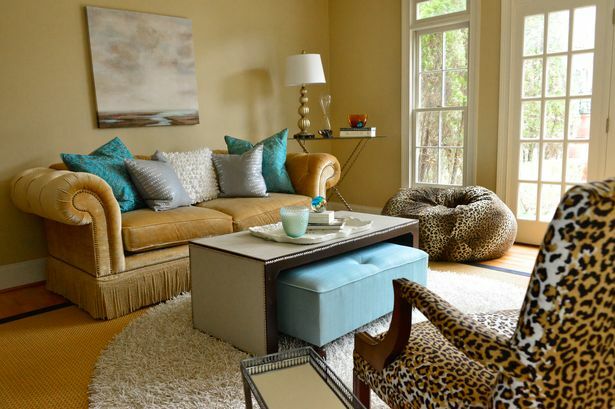 Its old-world charm adds texture, dimension, and character to the most popular room in the house. Whether you decide to add it to all four walls or just behind the vanity, it can be stained, distressed, painted or whitewashed. 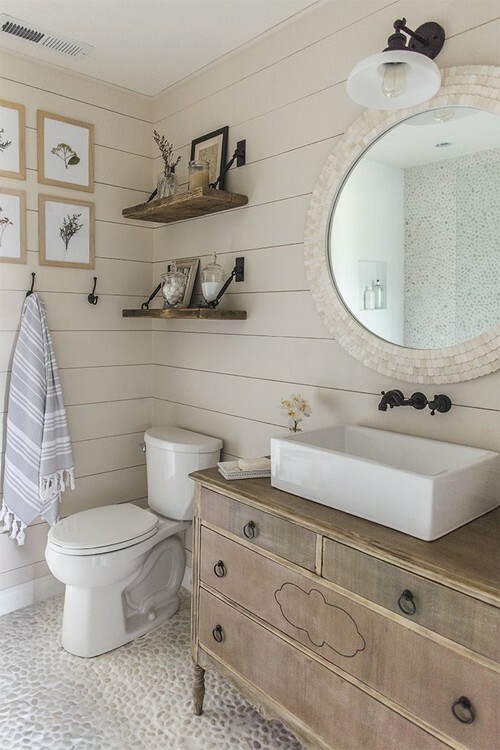 Adding textured shiplap walls is a sure way to transform even the most unappealing bathroom. 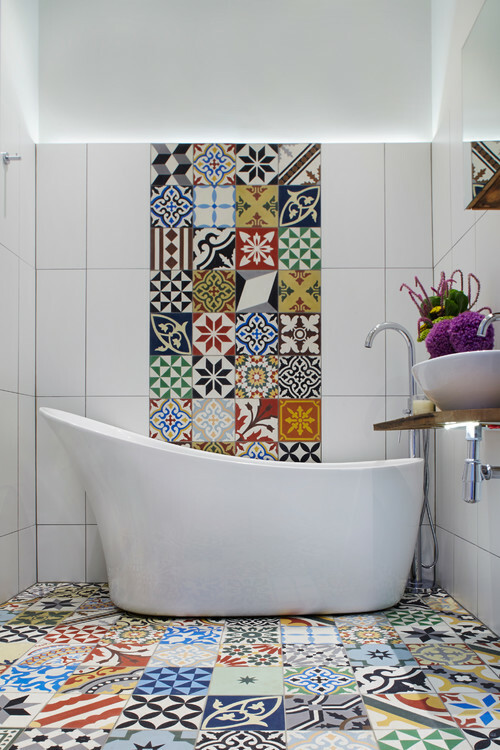 Moroccan tiles mostly are seen in kitchens as backsplashes are moving into bathroom designs. This is for the homeowner who is ready to step outside the box and go big and bold. Moroccan tiles are the perfect way to add a splash of color to an otherwise cold and sterile room. Are you ready to try something new? A patterned, colorful Moroccan tile could be a showstopper! Photo by Grainda Builders, Inc. Looking for a sophisticated bathroom design? Who wouldn’t love a separate drying area that held luxurious towels, skin softening lotions and comfortable seating? 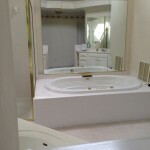 With larger bathrooms comes extra room with open floor plans. The hottest bathroom trend I see this year is the “no shower door” stall. 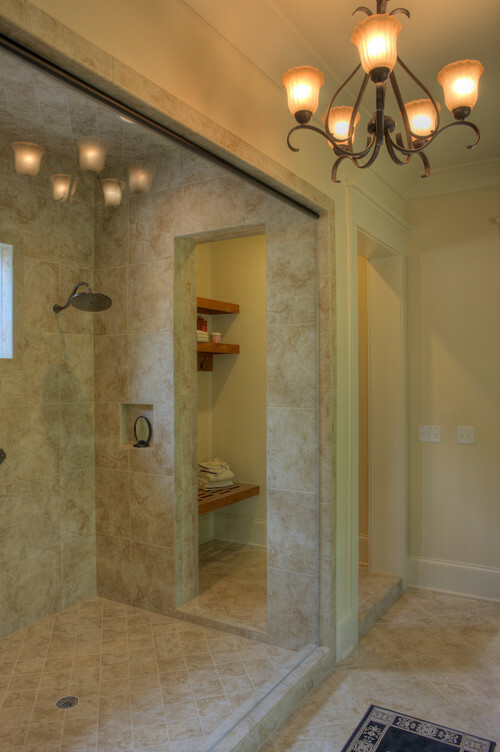 Better known as a walk-in shower, Roman shower or roll-in shower, they are all designed to require no door or curtain. 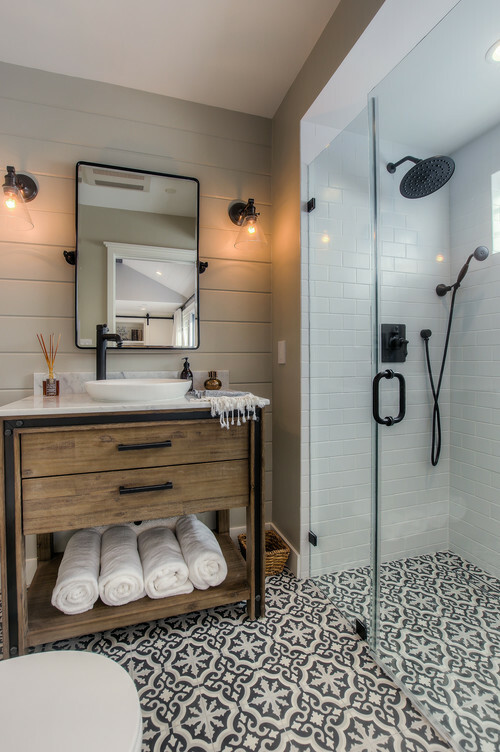 If you’ve ever spent a Saturday cleaning those hard-water stained shower doors, you’ll love this new design trend! Pair it with a rain shower head and freestanding tub, and you’ll have a spa-like treatment every day of the week. 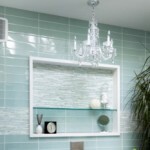 Are you ready to create your very own beautiful bathroom? 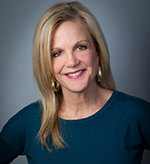 I’d be happy to help turn your bathroom into the most popular destination spot in your home. 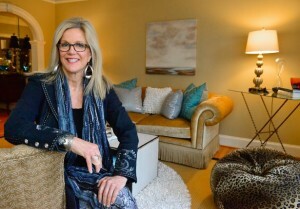 Check back next month when I highlight the hottest design trends for living rooms.